The Wyoming Knights of Columbus host their annual meeting ("convention") each spring. Wyoming has Knights from 29 councils dedicated to serving their communities and parishes. The Knights' bylaws require an annual meeting to vote on issues and select leadership. Knights will attend business meetings to decide on laws and attended corporate Mass at the convention. This is also a chance for the Knights to showcase their achievements and recognize outstanding achievements. Convention Proceedings are stored as Adobe PDF files. You will need Adobe Reader in order to access the Proceedings. If you need to download a copy of Adobe's freeware viewer, you can do so from Adobe's web site. PSD George Burns and "The Door"
The Traveling Trophy Door is more than just a door — it's a tradition at Wyoming State Council conventions. 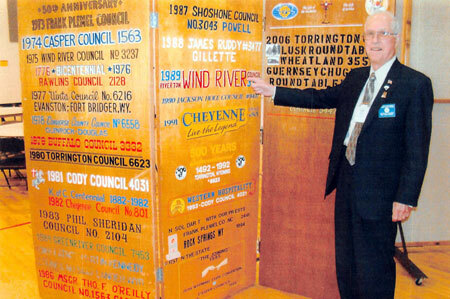 "The Door" has been passed around the great state of Wyoming for more than 50 years. Learn the story of "The Door" as related by George A. Burns (PSD, 1962–1964) in The Beginning of the K of C Traveling Door.